Home 44 , 45 Getting The News at 45, and What Was I Thinking!! Getting The News at 45, and What Was I Thinking!! I guess I should backtrack a little and say for the record, how blessed I feel to have had my first and it turns out only child at the ripe old age of 45 years old. She was the typical beautiful, bouncing baby who now fills every one of my days and finally, now she is three years old, just the occasional night. So there I was, 44 years old and well aware of how remote my chances of becoming pregnant without intervention were. They must be somewhere in the negative numbers by now I remember thinking. No problem. I'd stop taking birth control. I probably didn't need them anyway, and it would satisfy my husband who wanted to make sure if there could be a child in our future, at least we were allowing nature to take its course. So that's how I ended up like this. 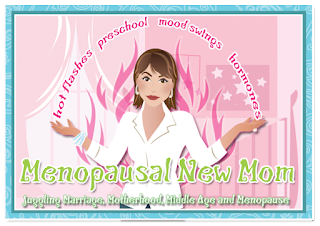 Up to my neck in dirty diapers and staring menopause right in the face! Read more: Getting The News and What Was I Thinking! !